Flying Friday: happy birthday, N32706! Three years ago this week, John Blevins and I flew Delta to Salt Lake City to pick up N32706 and fly her home. I was perusing my logbook earlier in the week and realized that more than half of my total flying time (318 hours of my total 611) has been sitting in the left seat of this particular airplane. 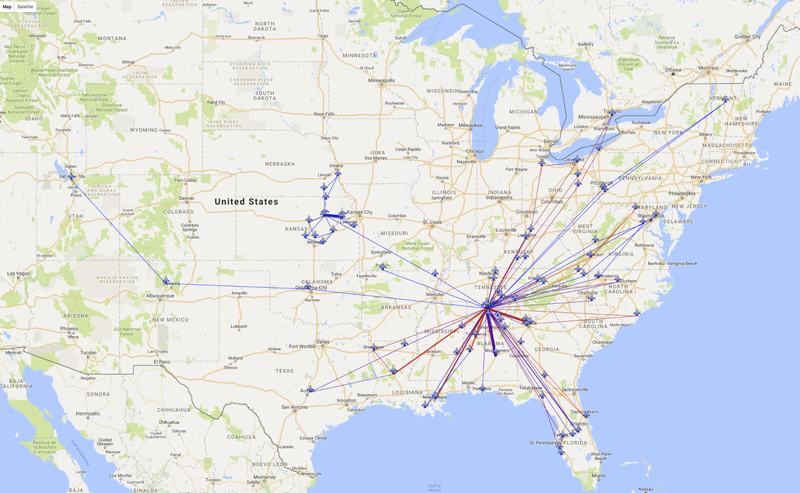 I’ve traveled for races/events (DC, Vermont, Texas, North Carolina, Ohio, West Virginia), family visits (Louisiana, Florida), business (Toronto, Missouri, Kentucky), and fun with the kids (Georgia, Mississippi, Tennessee), and flight training (Utah, New Mexico, Kansas, Oklahoma, Nebraska). There are times when I think it’s silly to own an airplane instead of renting– like a horse or a boat, you’re always paying the maintenance and fixed costs even on days when the weather is bad, you’re busy, and so on. But the freedom and flexibility of being able to travel where and when I want to, and the comfort of knowing that I’m flying a well-maintained, well-equipped airplane that hasn’t been neglected or operated improperly, more than make up for it. My next trip is later today, from Decatur to Orlando (well, Kissimmee) for a weightlifting meet. Later in the year, I’ve got Tuscaloosa, Biloxi, New Orleans, and a few other places on my to-go list. I can’t wait! If you think updating the software on your phone is hard, try it with avionics. Avidyne has been promising a new release of the software for their IFD line of WAAS GPS units for a while now. Originally announced on April Fool’s Day last year, version 10.2 packs a pretty impressive list of features, including synthetic vision, support for a bunch of new devices (including digital radar and FLIR cameras), display of more ADS-B weather and traffic data, and a new “IFD100” iPad app that essentially acts as a second screen for your IFD. They generously made the update available for free, but with a catch: it has to be installed by an avionics shop. The FAA lets aircraft owners make “minor repairs and alterations” (a phrase which has a very specific set of parameters around it), and avionics software updates aren’t considered “minor.” When they finally announced that 10.2 was available, the first order of business was to find a shop to install it. None of the local shops are Avidyne dealers, so we decided to head back to XP Services in Tullahoma. A quick phone call to schedule an appointment was all it took. 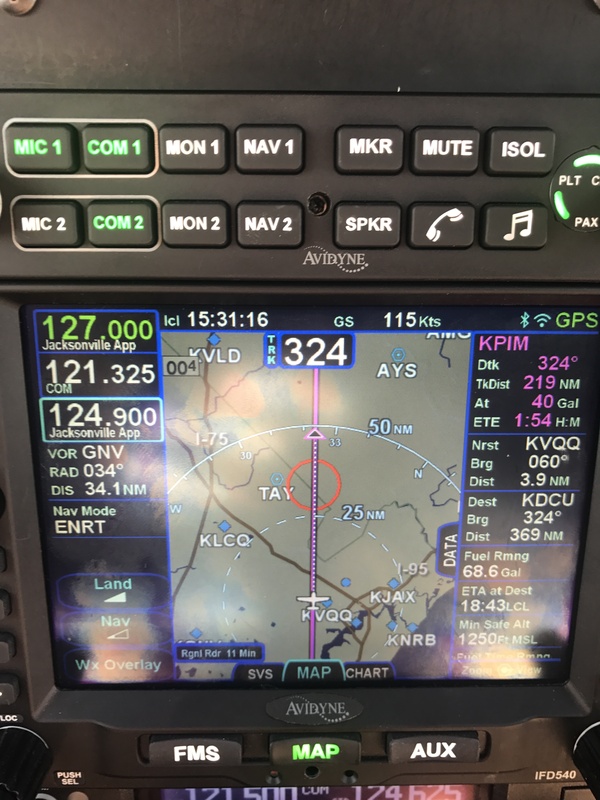 The flight to Tullahoma was pleasant, and the XP team had the upgrade done in about 2 hours– right about the amount of time Avidyne says it should take. The update procedure is very detailed and specific, with lots of dire warnings about what happens if you do it wrong, so I’m glad they didn’t. They also upgraded the software in our SkyTrax 100 ADS-B receiver, which will become important a little later in the story. I can’t say enough good things about XP’s staff: they did good work, quickly, at a fair price, and were very friendly. Be forewarned if you go there though: there are no vending machines nearby so bring your own snacks. On the way home I got to start playing with the new features, but it wasn’t until last week’s Easter trip from Decatur to New Smyrna Beach that they really came into their own. Here’s a partial list of the new goodness in this release. Let’s start with synthetic vision. 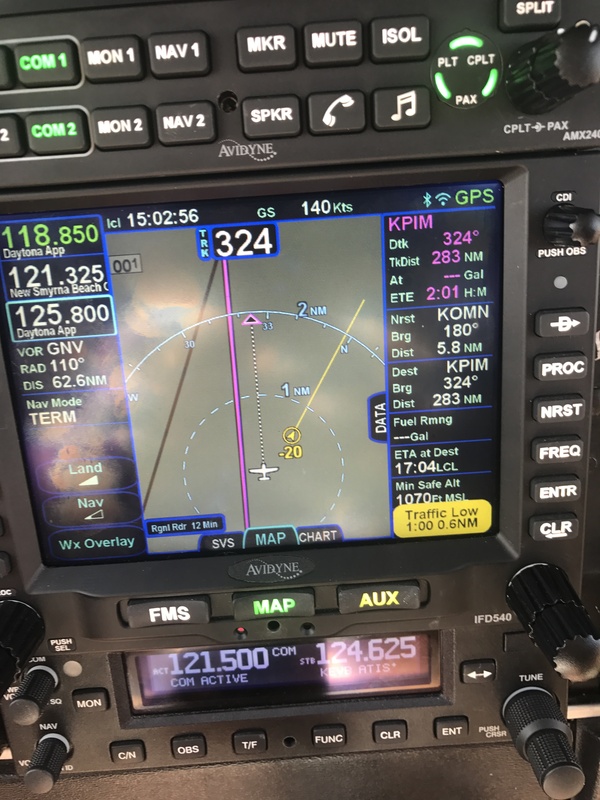 The IFD540 doesn’t have a way to sense the attitude of the airplane, so its syn vis feature is limited to showing a “plane in trail” (Avidyne calls it exocentric) view of you, your route, and the surrounding terrain. In this case, I’ve programmed the ILS 18 Y approach into my home airport. You can see the magenta line indicating that I’m on the final approach segment. The white line-and-loop to the upper right is the missed approach procedure that I’d fly if I couldn’t land. There’s another airplane in the area, at 1900 feet and descending. The synthetic vision display makes very clear what the surrounding terrain and obstacles look like, and how my planned flight path would interact with them. This is not a huge deal in the flat riverine terrain near Decatur but in someplace like Montpelier, with more significant terrain, it could literally be a lifesaver. Another nifty new feature: temporary flight restrictions (like the one shown below, for firefighting in southern Georgia near Waycross) and winds aloft data (the little white flag-looking things in the second picture) can now be shown along with all the other flight data. You can see that we have about a 20kt headwind. It’s important to remember that, like all other ADS-B weather data, the wind data comes from the ground and may not reflect what’s truly happening in the air at that moment. Traffic display is greatly improved in two ways. First, you can now see trend lines showing you where a traffic target is going (along with its N number, if it’s transmitting one). This is really helpful in crowded airspace, like the area around the Daytona Beach airport. You can see that both airplanes on the display are headed in the same direction as we are, one at roughly our same altitude and the other descending. I also now get traffic alerts when there’s a potential conflict, i.e. someone else is flying towards me. An aural alert (“bong! TRAFFIC”) comes first, then the screen changes to show the conflicting traffic. This is an extremely valuable feature. The IFD100 app does what it promises: it lets you control the physical IFD, but it also lets you configure its display completely independently of the one on the panel. It does about 80% of what the “real” IFD hardware does. For example, you can load a flight plan into the iPad app while the panel is showing you the map/weather/traffic page, then push a button and activate that flight plan from the iPad. You can see and tune frequencies (but not activate them), zoom in and out on maps, and in general act like you have a second IFD540. It’s pretty neat, although there are some quirks to it that I’m still figuring out. The IFD100 app isn’t a replacement for FlyQ or Foreflight though; it doesn’t let you anything that the physical IFD can’t do, so no looking up fuel prices or FBO reviews, no satellite imagery display, and so on. ForeFlight has all sorts of useful planning features like terrain mapping, wind estimation, and flight plan filing that the IFD100 doesn’t, and won’t. I don’t think Avidyne intends the app to replace a true electronic flight bag (EFB) app, but rather to give you more options and flexibility with using the in-panel hardware. I haven’t been able to test one of the signature features of 10.2 yet, though: its ability to do two-way sync over Wi-Fi between the panel device and a tablet. I can already stream a flight plan, and GPS position data, from the IFD to ForeFlight or FlyQ. 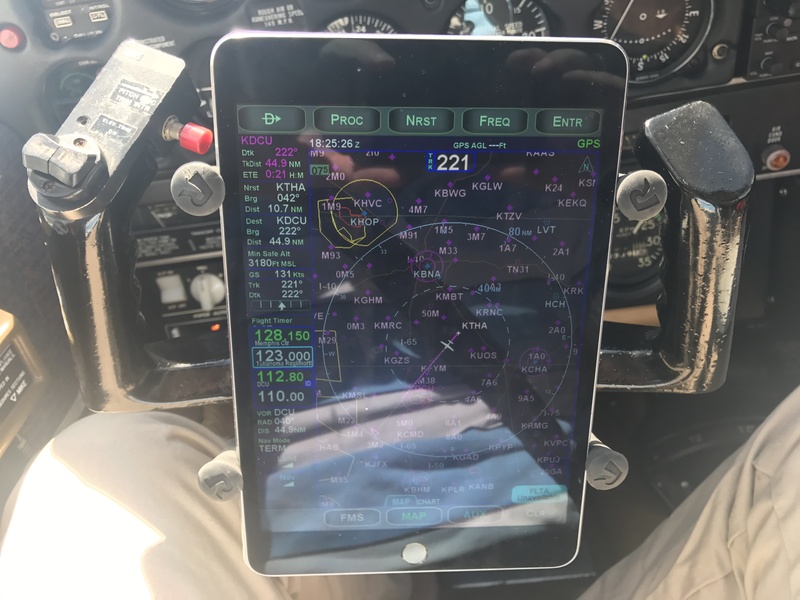 10.2 adds the ability for the IFD to send traffic, weather, and TFR data (which means I won’t need my Stratus receiver to see that stuff in ForeFlight), but also the ability to load a flight plan from the iPad to the panel. That means I can plan a complex route at my leisure in my armchair, file it, brief it, get my expected route, and push the route to the airplane when I get to the airport with a single button press. That’s going to be glorious when it finally arrives. 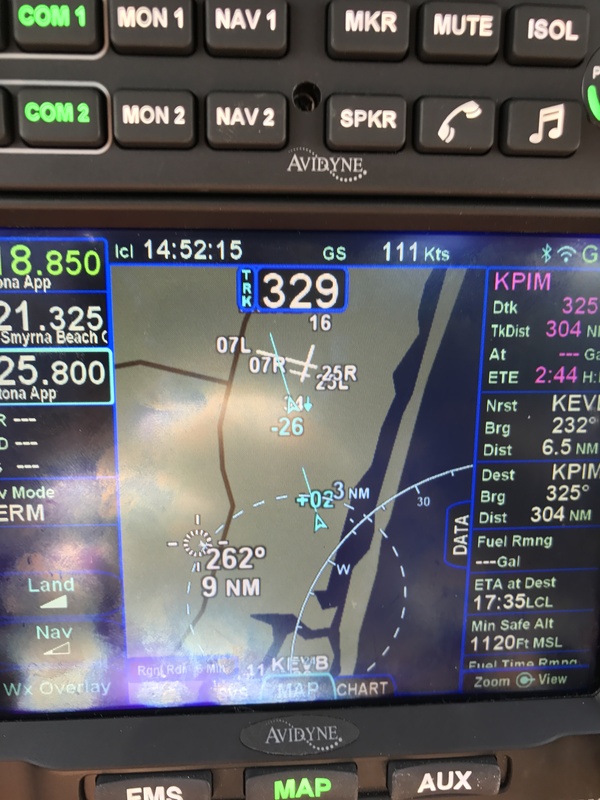 It speaks well of Avidyne that they made this major feature release available for free, and I’m excited to see how they continue to build on the wireless connectivity built into the IFD line. Yesterday, I had my first in-flight emergency. That sounds more dramatic than it actually was but I thought writing up my experience might be helpful. This is to the best of my recollection; a lot happened in a short time, so I might have muffed some details. With my plane in the shop, I wanted to get in a few instrument approaches, as well as work on my proficiency on the Cessna 182RG at Redstone. The 182RG is about 20kts faster than my plane, and it’s a great cross-country machine to have as a backup. It’s nicely equipped, with a Garmin GNS530 GPS (WAAS-capable, of course), an MX20 multifunction display, and two glideslope indicators. I called my pal John Blevins, an experienced instrument instructor, and we arranged to meet and go fly. 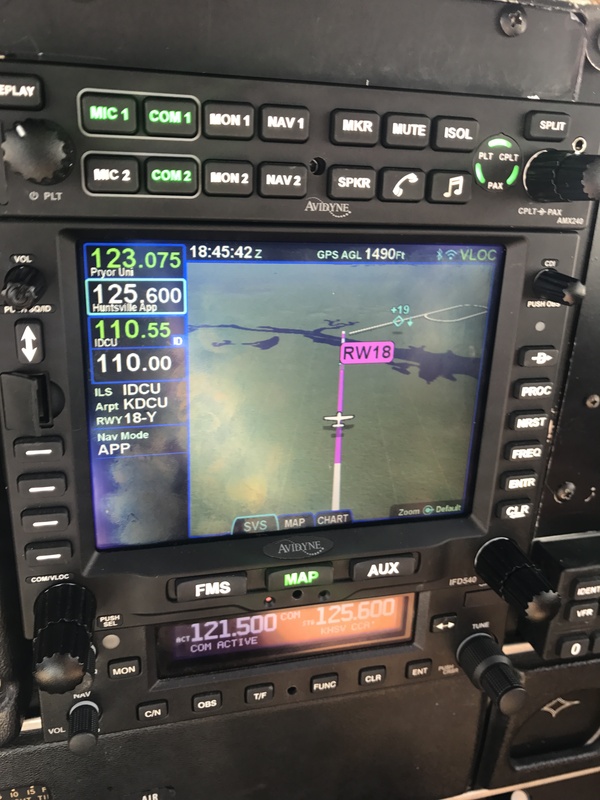 We briefed a simple instrument proficiency check (IPC) route– we’d fly from Redstone to Muscle Shoals, fly the ILS 29 approach, then turn around and fly the WAAS GPS 36 approach into Decatur, then the non-WAAS GPS 17 back into Redstone. The weather was just right– overcast at about 1900′, with a light wind. The preflight and runup were normal; I contacted Huntsville departure and we were cleared to take off and head towards Muscle Shoals. I got the airplane to our assigned altitude, cleaned it up for cruise flight, engaged the autopilot, and briefed the approach with John. During that time, we were cleared to the HUPOK intersection and told to expect a straight-in approach to the ILS 29. Our instructions were to cross HUPOK at or above 2500′, so after I had the radios set up to my satisfaction, I started our descent. 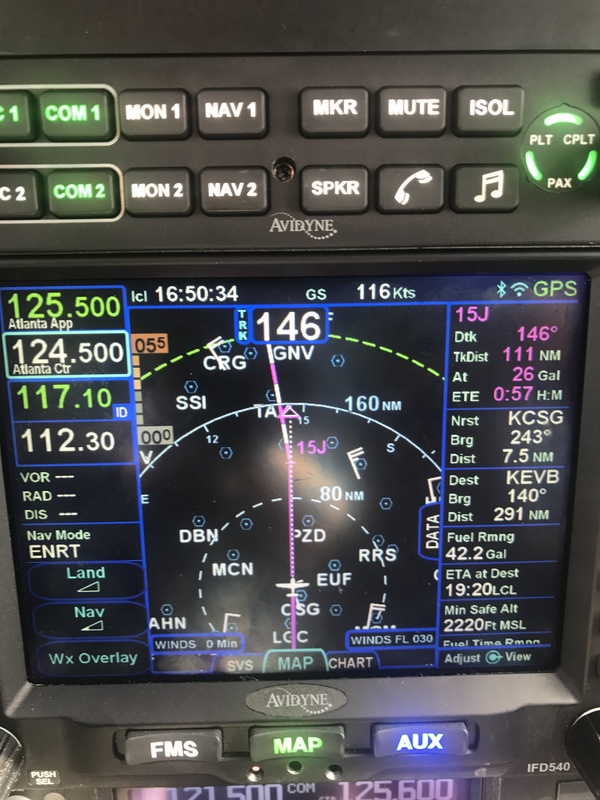 A brief explanatory note: on an ILS approach, you tune your navigation radio to the frequency specified for the localizer so that you get lateral and vertical guidance for the approach on the course deviation indicator (CDI). If you tune the wrong frequency (or forget to tune it, which amounts to the same thing), you won’t get that guidance. For that reason, I make a habit of tuning the localizer on both my primary and backup navigation radios. I did that this time, too. As we started our descent, I noticed that the GPS flickered, then went blank, then said “INITIALIZING SYSTEM” in the upper left corner. Simultaneously, the two guidance needles on the CDI started to bounce. 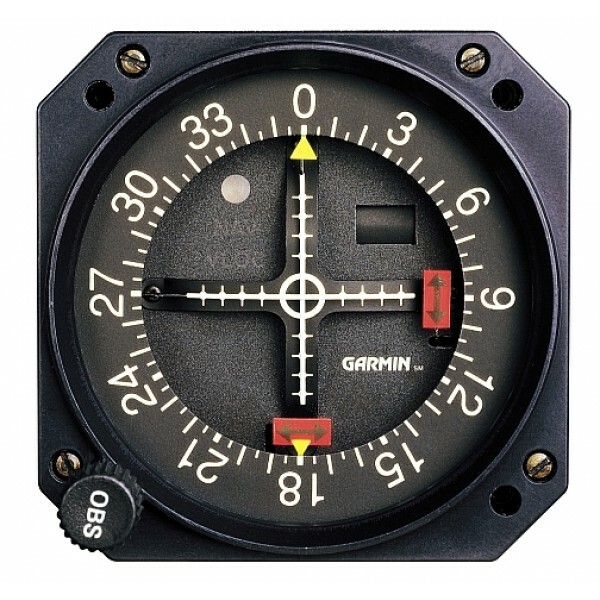 The CDI in this plane looks like the picture below: the needles move independently, so as the GPS went online, it was driving the needles towards the center (where they belonged), but when it dropped offline again, the needles drifted towards the upper left corner. Distracting, but not critical. I immediately disconnected the autopilot and continued hand-flying the descent. This first failure was annoying but not critical– an ILS approach doesn’t depend on the GPS, and because I already had the localizer tuned on the other radio, it was a simple matter of looking at the other CDI. We broke out below the clouds, at which point the MFD went blank, along with the GPS. The transponder was flashing “FAIL” instead of the 4-digit code we had been assigned. Then it, and the backup nav radio, all quit. We still had electrical power, but all of our radio navigation instruments had crapped out. John wisely suggested that we shed some electrical load, so we turned off all the stuff that wasn’t working anyway, verified that the ammeter indicated normally and that no breakers were tripped, turned off the avionics master to do a bus reset, and then started turning things back on. While we were doing all that, I was heading the plane due east, back whence we came, staying at least 500′ below the overcast layer so we could maintain VFR. We spotted the Courtland airport (9A4) off to our south, and I decided to head towards it in case we wanted to make a precautionary landing. John was working through the verrrrry skimpy emergency checklists. I flew us for a straight-in approach to runway 31 at Courtland, but when I extended the gear we didn’t get the “gear down” light and couldn’t verify that the gear were locked– so I initiated a go-around and we started some more troubleshooting, this time with the “emergency gear extension” checklist. We decided it would be better to raise the gear to release any residual pressure in the accumulator, so we did. About this time COM2 started working again, so we called Huntsville to tell them we were heading back to Redstone. Shortly after I turned us for home, the LOW VOLTAGE panel annunciator lit. I discovered that the alternator circuit breaker had popped, so I reset it. I have a one-and-done rule for circuit breakers in flight– for a critical system I’ll reset the breaker once, but if it pops again, it’s time to land. The light went out, and the breaker didn’t pop again. Because we were below the clouds and knew where we were, it was easy to navigate visually to get us pointed in the right direction. On the way home, for no good reason that I could see, the GPS began working normally. We left the transponder off, since we were in radio contact with Huntsville and they could see our aircraft on radar. The approach and landing were uneventful too, except that I didn’t use any flaps. The Cessna 182 flaps are electrically actuated and we agreed that there was no reason to crank them down, putting extra load on the electrical system. Here’s a partial map of our flight route. After we landed, John and I discussed what happened, how we reacted, and what we learned from it. On the positive side, we displayed excellent crew coordination, and I was glad to have an experienced pilot in the other seat. The multiple failures were annoying but not critical; the weather was tolerable, we were in a familiar area, and John and I both had iPads with GPS for backup. On the negative side, I wasn’t as familiar with the emergency procedures for this airplane as I should have been (although part of the flight’s purpose was for me to practice emergency procedures). This morning, I filed an ASRS report; ASRS is a unique success story, and I plan to write about it for my next Flying Friday. Then I wrote this post. I’ll look forward to seeing what Redstone’s mechanic finds. I don’t think there were any telltale signs that I could have caught during the preflight or runup, but I will continue to keep my eyes very sharply peeled. There’s a difference between flying under instrument flight rules (IFR) and flying in instrument meteorological conditions (IMC). When you fly IFR, that means you’re flying on an instrument flight plan, along a defined route, in communication with and under positive control of ground-based air traffic control. When you fly in IMC, that means you are flying “primarily by reference to instruments,” as the FAA puts it. That basically means that you can’t see a discernible horizon. You can fly IFR in good weather or bad. If you’re flying in IMC, you must do so under IFR. If you’re flying in visual meteorological conditions (VMC, what normal people call “good weather”), you can fly under visual or instrument flight rules. This whole post is basically just an excuse to post a short video showing one example of flight in IMC. I took it while en route from Decatur to Tampa Executive; on that 3h40min flight I was in the clouds for just under an hour. You can’t see a visible horizon, although the sun was semi-visible through the clouds. (If you take a look at the iPad screen, you’ll see why it was so cloudy.) Surprisingly, on a sunny day, the inside of the cloud can be very bright with diffuse light, leading to the somewhat odd behavior of wearing sunglasses while flying inside a cloud that blocks the sun from the ground.